Two Middlesex University Computer Science students are helping develop the website for a new charitable social network designed to enable people to help others around the world. 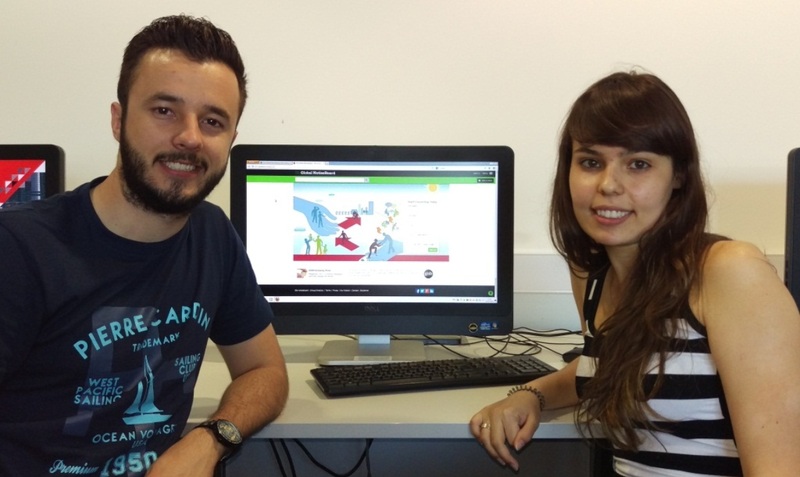 Milena Martinelli Lopes and Fernando Fae are both studying at Middlesex as part of the Science Without Borders exchange scholarship from Brazil and have been working with The Global NoticeBoard (GNB) on a three-month work placement. Their placements are part of an ongoing relationship between Middlesex and GNB. Staff from the University's Computer Science Department are contributing expertise to the platform's development while students get the opportunity to work on real-life industry projects. "As part of Science Without Borders we needed to do an internship, and GNB is a really interesting project to be a part of," explains Fernando. "It's been a good experience for me. I'd never been outside Brazil before coming to Middlesex so it is great to experience the environment and culture." "Working in London will be really amazing on our CV when we return to Brazil," adds Milena. It's a new technology so it is really nice to have the opportunity learn about it. I am really excited to see the site launch." When it launches in September, GNB will be a free platform supported by a charitable foundation. With the mission to be 'Facebook with a purpose', it aims to help people connect with others to both offer and ask for help – whether volunteering, fundraising or something else. GNB Director Guy Insull is delighted with the contribution of Milena and Fernando and is looking forward to continuing work with Middlesex Computer Science staff and students. "We've been very pleased with them," he says. "There is an element of them receiving training from us but it's not just that, they are making a real contribution to the project and we really value having them here."